Click this link for paperback http://howtohavefaith.wordpress.com I have also lowered the price for the book as a paper back to $20.00 in the United States only. Writing for the glory of God, is the greatest joy, I receive in my gifts and callings. I have always been able to express myself, via writing. It comes naturally to me. I do not get “writers block” because as I submit to God, and His truth according to my King James Bible, the insight, and inspiration comes so naturally to me. My mission, is to bring glory to God in my writing, and speak a word of truth to the Lost, and yes inspire Gods children. So whenever, I have a chance to write for my Lord, I feel honored, that He would choose me to be an expression of His Kingdom, and love. I am always honored, if people see God through my writing. But I want to be careful. Glory and honor, goes only to God. Sure, I enjoy, being favored, and having people be inspired, by my writings. But I don’t want them to see me. I want them to see God, in everything I write. I want God to be so honored and exalted by anything I do or write. Jesus gave us the ultimate sacrifice of love, and I just want people to see His love and truth in my writings. Tell us about your blogs. I have a few blogs on the internet. But my most used, and successful blog is entitled: “Elena’s Just My Thoughts:…. Here I write posts that can have an impact on a person, searching for truth, answers, and inspiration. Subject matter can relate to faith, as well as issues that concern family matters, prayer, and so much more. Go to these links if you want to see more. And yes sign up for the other blogs. Feel free to share this post with your friends as well, so they can get inspiration too. Hope in God. Inspiration, from the Lord, that tells me, no matter what I am feeling, or going through, God can change my circumstances. I suppose this is why I wrote my book. “How to Have Faith ~ My Secret Principles of faith with a true and living God, Jesus Christ and the Holy Spirit. Because I have been at the bottom of the barrel, I have been down and out. I have learned to have faith, and even the hard way. But God….He has taught me never, ever to let go. Because with God all things are possible. With just this scripture, I can have inspiration to start my day. And not only survive, but thrive. BEHOLD I AM THE LORD, THE GOD OF ALL FLESH: IS THERE ANYTHING TOO HARD FOR ME? JEREMIAH 32:27. My relationship with God, my family, and home, are the most pleasurable things I find in life. Its not always the big things, but the quiet time, and inspiration I get to refresh myself, in my time, that pours so much into me. Spending time, with true Christian friends, means so much to me. At this time in my life, I have weeded out friends, who were masquerading in friendship. So when I spend time with friends, who appreciate me, and love me as well as my family does. I have a sense of Gods fellowship in this time as well. It is love…. I began to see my writing skills, when I worked in the corporate world. Whenever, I had a need, I would submit a proposal, or I would document my thoughts. I began to see, that I could get results by my writing. The power of the pen, is a gift, that I do not want to use, for anything, but for things that are good, and right, and yes inspired by God Almighty. To speak to someone who is hurting, or broken. To bring light, and hope, in a world, that needs truth. I never want to hide truth. I never want to give place to the enemy, when I can share what God says. So I write. I write what Gods word says, from my King James Bible, and that is my foundation, for anything I write. What does Father God say about it? Ask me, in my blogs, or for my book. I will try to help. The Bible really does have an answer. Yes…. Truth, can be expressed by writing in such a way, that it can leave someone breathless, set free, and in awe, totally inspired. Are you available to speak publicly to discuss your book? Yes, I am available to go to your church congregation, ladies group, or business function. I can give my testimony, and share what God has done for me. 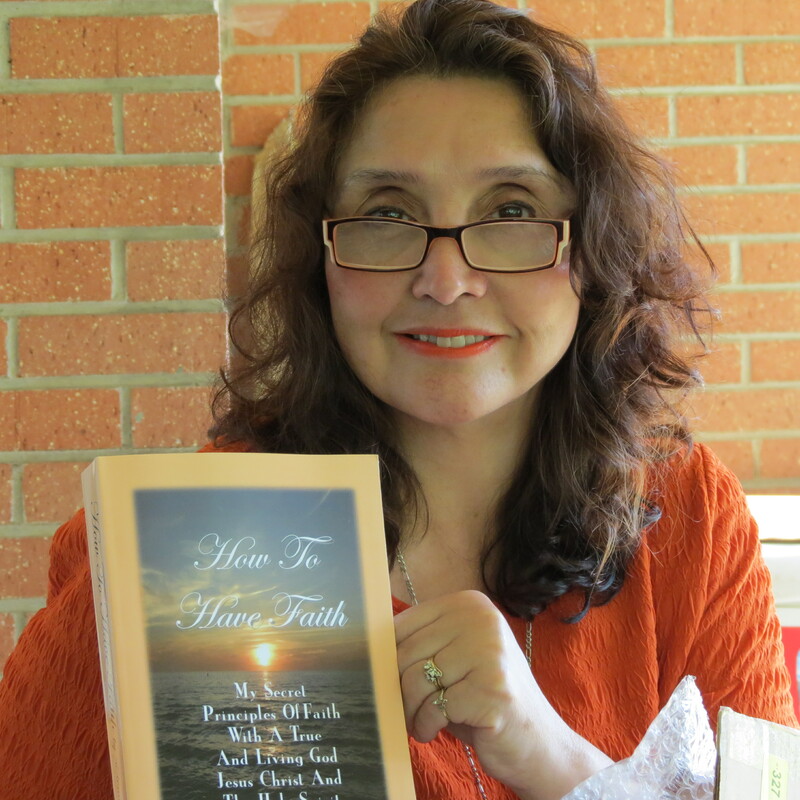 I can tell you, why my book, “How To Have Faith, My Secret Principles of Faith, is based on a true and living God, Jesus Christ and the Holy Spirit.” It was written, from all that I have gone through, and I have learned. These “Secret” Principles I have learned, may not be a secret to some, yet to some they are. I just know, that we all need to grow and learn, and yes I still am learning, but one must choose to grow, and yes tweak your faith. If it is even just one thing I can pass down to someone to learn about faith, and what pleases God this will be worth the investment of the book. And isn’t that what it really is all about? Pleasing God, so we can get answers to prayer. To develop our relationship with God. And yes increase our faith. I know that I know there is a God, a wonderful King, and savior. Jesus Christ, and yes a Holy Spirit that does know us inside and out. And there is so much more. Its not about religion, it is about developing a relationship according to His “principles” to have faith. Go to the link for “my profile” that I have for ordering my book, (paper back) to e-mail me. Or my Facebook page. There you will get updates and posts of inspiration as well. You will need to request my “speakers packet.” And yes please, download the book here at Smashwords. As of today, March 13th, 2014. I have lowered the price from $17.00 to $10.00. Why to ten dollars? Because a tenth is Holy unto the Lord. Leviticus 27:32. I have been mindful of people and their budgets, and the price of a book. Where truly I understand, your not getting a book, to hold in your hands. You are getting knowledge, insight into God. From your reading device. And because I know the value of these “secret Principles” I know the value, exceeds monetary expectations. But it really is up to you. What your spiritual growth and desire is to pay for such knowledge. To me, all that God has taught me, I cannot put a price tag on. But I am grateful, and I want to help others. But, I have invested a lot of time, and prayer, into this book. And God guided me through each page, that I wrote. I know, that I know, “Secret Principles” that could help someone. To grow, to understand Gods ways. I encourage you to read the free, first five percent, of pages that I have allowed to get a better understanding of my heart, and yes Gods heart in these “Secret Principles.” Click the bottom link to direct you to the sample. You will want to order it. And if you do not you will never know. Yes, what God could have shown you through this book. And I do not say that to be arrogant, but very humble, knowing the gift God gave me as I wrote this book. I know my Lord, I know Him, and His beautiful Spirit. I know His truth, the Holy King James Bible, I know the author, and He does have standards, that many do not understand the principles to His ways. But I do. I know His heart, in Love. Faith pleases God, and He showed me. I receive it and I share it in His love. Obedient, to Christ. This book will show someone how important Salvation is. It is a great book to give to an unbeliever, as a gift for someone searching, for answers. You can buy it for someone, who needs faith. And bless them. And you can buy it for yourself, and bless yourself. This book will not return void. Even if it is one thing, that is revealed….I know, it can show you. HOW TO HAVE FAITH ~ MY SECRET PRINCIPLES OF FAITH WITH A TRUE AND LIVING GOD, JESUS CHRIST AND THE HOLY SPIRIT. This morning the Lord spoke to my heart, and I could sense, in my heart, that people need proof. I am trying to get people to see, these secret principles that work for me, but faith, is very personal, and sometimes very private. I want people to see who I was before Christ, but also who I am now. And God has made all the difference. I give Him glory. The whole book is proof because I know. But if you are looking for “fruit” as proof. My marriage, to my husband is evident. I have true love. I have a marriage, that God has blessed. And there is a reason, why it is blessed. I give instruction, and yes definite reasons why in my book. I want you to grow in who you are, and yes, I do emphasize these principles, but if you are looking for true love, yes, I have the proof in my book, and I share it. It is chapter 26. THE SECRET PRINCIPLE OF MY FAITH TO TRUE LOVE. If you are lonely, and broken, and you have given up hope, about finding true love, I want to encourage you. Or if you are in a relationship, that needs to be fixed, this remedy can work as well. This can change. And yes, if you follow my instructions in this, that is in my book. I know you will find success and happiness. And yes true love. This proof may be what you need, for your own life to change. Yes it is my secret to true love, and it is proof to me, God has principles. And I obeyed. Thanks and blessings…to Smashwords, and to all who have taken time out of their day to read this.